You ever get to that point in a Japanese role-playing game? You know. The point where you want to turn it off. There you are, killing monsters and leveling up and minding your own business, when in comes a pair of tiny twins or a cackling rogue to ruin your day with voice acting that even Kristen Stewart would call hammy. Voice acting is the worst. Let me explain. While playing a console RPG made in Japan, you'll usually follow a progression that looks something like town-> cut-scene -> dungeon -> cut-scene -> town -> cut-scene -> dungeon. And again and again and again until you beat the game. In the old days, those cut-scenes consisted of animated sprites wobbling around your screen to the tune of (usually awesome) grand melodies. We'd scroll through text boxes and scanned as much dialogue as we felt like reading. Sometimes the translations would be mangled or the lines would sound awkward, but that wouldn't matter all that much because nobody was saying them out loud. Our minds automatically corrected the mistakes and filled in the blanks. Today, a big-budget console JRPG, like most big-budget console video games, presents its cut-scenes as full-fledged short films, complete with experimental camera angles, ostentatious set pieces, and... voice acting. Instead of reading text boxes and imagining how our favorite heroes sound, we get to listen to them talk. In theory this should be awesome. It should allow writers to tell better stories. Voice acting, an art that has become an integral part of video games over the past half-decade, should help us empathize and fall in love with the large casts of divergent characters that inhabit RPGs. The voice acting of your average JRPG is stiff, shrill, and whiny. It's like listening to Xbox Live. In practice it is not awesome. The voice acting of your average JRPG is stiff, shrill, and whiny. It's like listening to Xbox Live. It's hard to describe precisely why a JRPG's voice acting can be so irritating, much like it's hard to describe what makes good acting good acting. There are so many little choices that an actor makes—what sort of inflection to put on every syllable, how to pronounce certain words, which emotional reactions to try and capture—that it's impossible to look at a work of voice acting and objectively gauge whether it's "good" or "bad." But what I can judge is how it makes me feel. And when a bit of dialogue makes me shout "oh come on" and throw things at my screen, when it makes me feel the urge to turn off my console and do something less mawkish, like knitting or poetry-writing, I think it's safe to say that dialogue doesn't work. I'm sure you've been there. My suspicion is that good voice acting, like good acting or good writing or good ninja-ing, is totally invisible. When I play The Last Story, for example, one of my favorite RPGs from the past few years, I don't think things like "gosh darn these Brits sound authentic." I don't even realize that there's acting involved. Voiceovers are bad when you notice they're there. 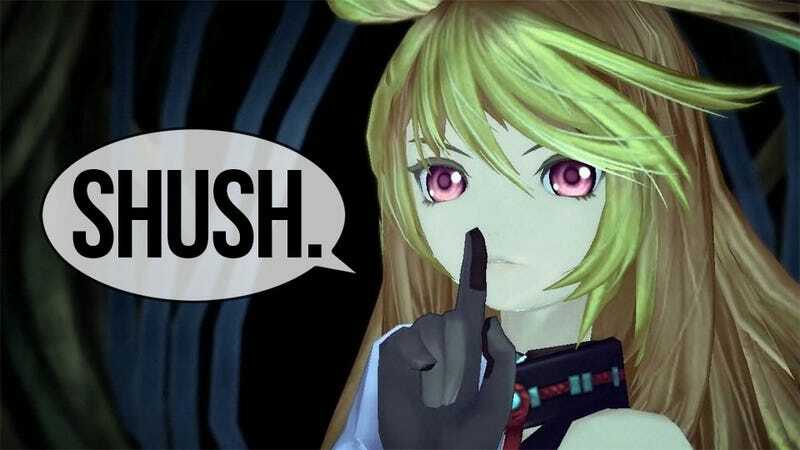 So when I'm sitting down with a modern console JRPG—like, say, Infinite Undiscovery or Tales of Vesperia or Star Ocean: The Last Hope—and I'm listening to some characters talk, I hate that all I can think about is how awful they sound. How annoying. Out of place. Whiny. This all occurred to me as I was sitting on a flight from New York to Seattle, playing the hell out of the new iPad version of The World Ends With You. "Why is this so awesome?" I started asking myself. There are a few reasons, one of which is that the dialogue is sharp, smart, and real. Characters interrupt one another. They speak in short, pointed sentences. They don't always say what they mean. This is the sort of dialogue that works because nobody's speaking it out loud. Voice actors don't have to struggle over soundbites like "augh" and "nngh." The translators were able to write engaging lines without having to worry about how they'd sound out loud. That can be surprisingly liberating. Cloud: ...Aerith. This can't be real! Cloud: ...Shut up. The cycle of nature and your stupid plan don't mean a thing. Aerith is gone. Aerith will no longer talk, no longer laugh, cry...... or get angry...... What about us...... what are WE supposed to do? What about my pain? My fingers are tingling. My mouth is dry. My eyes are burning! Sephiroth: What are you saying? Are you trying to tell me you have feelings too? Cloud: Of course! Who do you think I am!? Let's try to imagine what that scene would be like with voice acting. You know what. Never mind. Let's just move on. I feel a little sorry for the folks who have to translate big-budget Japanese games into English. When a translator works on cut-scenes, he or she has to come up with English lines that are timed perfectly to fit with the animations of the Japanese lines. This is much more difficult than it seems: when Japanese is translated to English, dialogue can be shortened or lengthened by drastic amounts. For translators it can be like putting together a jigsaw puzzle where you have to invent all the pieces. The best translations can also come when there are no cut-scenes to worry about. Look at the beginning scene of Nier, for example. Listen to how passionate the words are, how quickly they grab your attention. They work because they're spoken over a dark screen. The localizers didn't have to worry about timing or pacing or matching up with lip flaps. They could just write. And, hey, sometimes voice acting can work quite well. Nier is a good example, as is the aforementioned The Last Story. But even a single irritating or poorly-delivered line can take you right out of a story. It can make you want to stop playing. It's even made some players hate the genre. So what's the solution? Should we switch to silent mode? Is it really feasible for JRPG developers to get rid of voice acting entirely? I wish I had an answer. Maybe more RPGs should take after series like Mario, where instead of voice acting, characters all make weird (adorable) noises while chattering. Maybe they should find some combination of voice-acted lines and silent lines, like Persona 3. Maybe they should telepathically transfer dialogue to our brains. But the current system isn't working. And when I play a game like The World Ends With You, or Trails in the Sky, or Mother 3, or Radiant Historia, or any of the other well-translated, well-written, well-produced Japanese RPGs out there, I can't help but wonder how much better some games would be if the characters would all just shut up.